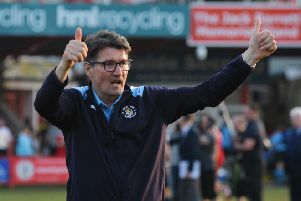 Luton Town interim manager Mick Harford revealed the club are looking to add to their squad ahead of Saturday’s crunch League One home clash against Peterborough. The Hatters did bring in Derby County midfielder George Thorne on loan for the rest of the season last week, but are now actively pursuing other targets, as Harford said: “We are looking, I’ll be honest with you, we are looking to bring one or two in. “Obviously I can’t name names, it’s a long haul trying to get a player in nowadays in terms of a loan or a signing. Town are slightly depleted upfront, with forward Danny Hylton suspended for the next three games, while Harry Cornick remains a doubt after his ankle injury. It led to Kazenga LuaLua being used a makeshift striker during last night's FA Cup defeat to Sheffield Wednesday, while Luke Berry came in to, with Alan McCormack rested. Harford added: "We put Pelly (Mpanzu) where we believe he does a good job (holding midfielder) and Luke came in. "Luke’s on his way back as we know and Alan’s at that age where we have to look after him a little bit, so thought it was a thing we had to do. "Wth Danny’s suspension, Kaz came in and looked lively and bright and sharp, he was a real threat. "So those changes were really enforced because we have lots of important games coming up."